Nugget came to Save The Animals Rescue Team II (START II) in July from the south where he was placed onto the euthanasia list until START II intervened. 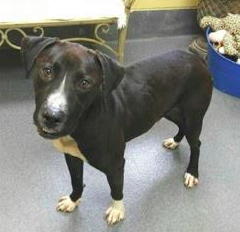 Nugget is considered a male medium black Labrador mix. 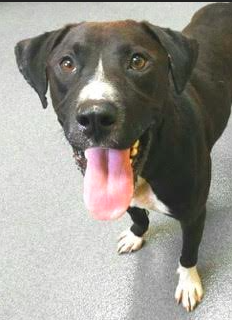 Nugget is a happy go fellow who is very handsome and always has a smile for you. He is considered to be approximately 2 ½ – 3 years of age. Unfortunately START II does not know his entire past, but he is extremely friendly, smart and would be a great addition to any family. Volunteers feel he maybe best with slightly older children as he jumps a lot and is very puppyish. In addition, volunteers feel no cats as they are not sure if he just wants to play with them or go after them. Nugget is considered to be about 45 pounds. He walks well on a leash, loves to play with his toys and with anyone who is willing to spend time with him. Nugget in addition is wonderful with other dogs. Nugget is neutered and up to date on all of his routine shots. Nugget and his friends are up for adoption at START II. If you are interested in meeting Nugget, please fill out an online application at www.startii.org or call the shelter at 201-797-8861. Also find us on facebook at facebook.com/SaveTheAnimalsRescueTeamII. Please remember when adopting a new pet, that this is a life time commitment. If you cannot adopt Nugget, please consider sponsoring him until a loving home can be found. Your donation is tax deductible and a letter will be sent for your taxes. Please mark checks sponsorship and name of animal you wish to support. You may continue with your sponsorship once the animal is adopted or cancel at any time. Please mail all information to START II PO Box 177, Elmwood Park, NJ 07407. Please visit the group and animals at the other locations: PetSmart Paramus (cats and dogs) M – Th by appointment only, Fri 7p – 9p and Sat 11a – 8p, Wayne PetSmart (cats only) M – F by appointment only, Sat & Sun 11a – 5p, Nanuet PetSmart (cats only) M – F by appointment only and Sat & Sun 11a – 4p. If you cannot make these times, please call the group to make a special appointment.